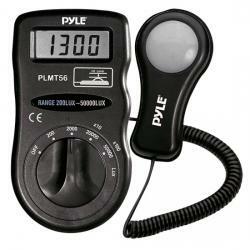 This light meter from Pyle measures in lux . To measure light, it utilizes an advanced, long-life silicon photo diode. Measures 1.5 times per second for quick, accurate info. The PLMT56 is equipped with an over-range indictor, photo detector, and includes a 12V A23 battery. Max range: 50,000 lux.